You may be wondering if revision surgery on your nose will fix a hanging columella. The bridge tissue separating your nostrils at the nasal base is referred to as the columella. It’s usually in a place where, at most, about four millimeters of your nostril can be seen while looking at your profile. When there is more than that showing, it’s often referred to as a hanging columella or a columellar show. Congenital. Some people may be born with it or it may be from an overly long septum that pushes the columella down. It could also stem from the position of columellar cartilages. Past rhinoplasty or nasal damage. It could be caused by previous surgery, often because of too much cartilage resectioning and/or nasal retraction. The condition can also be caused by a cartilage graft to increase projection of the tip of the nose or to stabilize a new tip that protrudes farther out than it should. 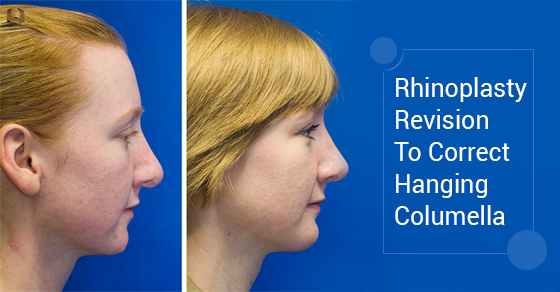 In rhinoplasty, a hanging columella is usually caused by removing too much nasal tip cartilage or the lateral crura. After surgery, as scar tissue grows in the part of the nose where too much lateral cartilage was removed, contraction happens, showing the hanging columella, which gives a pug nose look. It’s very important to address the issue with a rhinoplasty specialist like Dr. Oakley Smith. Correcting a hanging columella may be straightforward and one of the least complicated procedures or it could be a little more involved. A seasoned specialist like Dr. Smith can help you make the right decision for your situation. If the goal is to reshape the columella for a nice marriage between it and the nostril area (or the alar region), Dr. Smith will decide on the best surgical technique, paying attention to the shape of your nostrils, rotation of the tip, alar notching and the volume and sturdiness of tip cartilage, among other things. He will also be mindful of the relationship of the columella and tip to your upper lip when fixing a hanging columella, whether it is a first surgery or a revision of a past rhinoplasty. Once it has been ascertained that your columella is too low, Dr. Smith will decipher the most prudent surgical approach to correct the issue. Give his office a call today to schedule a consultation.